The Most Beautiful, Easiest to Use Calendar. Period. Accessible from anywhere. Perfect for you and your staff. 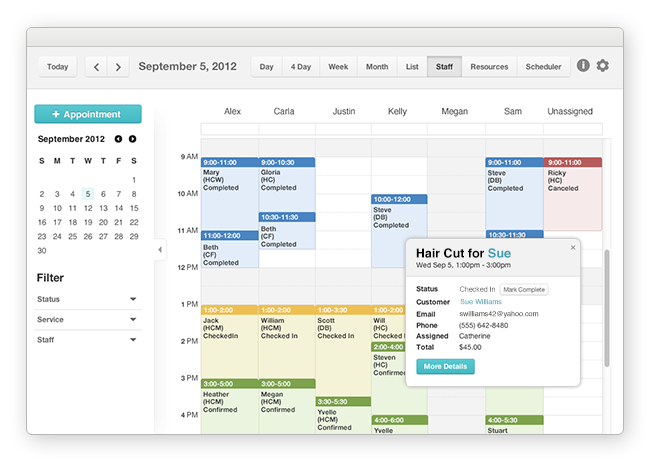 With simple online appointment scheduling for your customers. It’s a game changer. Personalized email communication in seconds. You never knew marketing could be so easy. Know your customers. Our amazing customer management system captures every detail, so it's easy to anticipate your customers’ needs. Our system knows how to schedule like you do. Don't worry about double booking or over scheduling. See our customer relationship management and scheduling software in action. Our business has grown a phenomenal 50% in revenues since we started using Store Vantage. Store Vantage was originally built by pet groomers, for pet groomers. We understand what it is like to run a pet grooming business, and how a scheduling software should work to make you more successful. and to make your customers smile. Store Vantage helps you succeed.